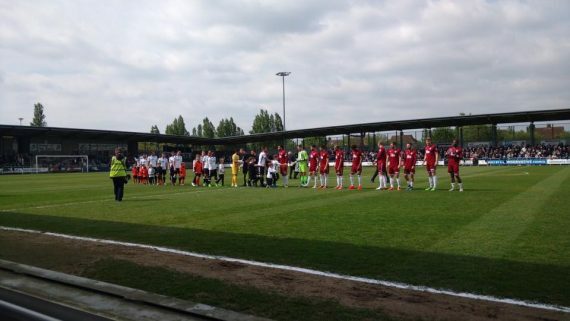 Chelmsford City dominated the second half of this second leg at Princes Park scoring twice to secure their place in the National League South promotion play-off final. The game began in thunderous style and it was The Darts who created the first opening. Alex Brown linked up well with Harris on the right hand side although Duane Ofori-Acheampong, sliding in, was unable to direct the low cross towards goal as visiting ‘keeper Ross Fitzsimons smothered the ball. As was probably to be expected chances were at a premium as the two sides were meeting for the sixth time this season, with only nine goals being scored previously. Deren Ibrahim, limited to a handful of kicked clearances in the opening half, saw a late flurry of first half action as Robbie Willmott struck a swerving free-kick at goal although he saw it well to tip it over the crossbar whilst carefully watching a Louie Theophanous long-range effort sail over the bar – The Clarets man easily, and unexpectedly, dispossessing The Darts defence. The second half however was a totally different game as visitors Chelmsford right from the whistle took the game to The Darts which proved a decisive move. Winning a number and variety of set-pieces and throw-ins around the penalty area Chris Bush caused problems with his long throws then hitting the post with a low left-sided cross/shot, Chris Dickson soon after glancing one of Bush’s long throw-ins onto the top of the crossbar. The Darts were under constant pressure and eventually it told as Chelmsford took a deserved lead. Chris Dickson held up the ball well in the right corner and in getting away from his man put in an inviting low cross which Louie Theophanous stooped to head home. Desperate to equalise and get back into the game The Darts threw men forward and it proved costly as Dickson ran clear from halfway and unleashing an unstoppable curling effort past Ibrahim to send the visiting fans into dreamland. This entry was posted	on Sunday, May 7th, 2017 at 4:55 pm	and is filed under Football, Non-League Football. You can follow any responses to this entry through the RSS 2.0 feed. Both comments and pings are currently closed.